Combine all ingredients except pecans in a large saucepan. Bring mixture to a boil slowly over medium heat, stirring frequently. 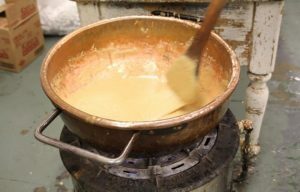 Boil until soft ball forms when a little bit of the mixture is dropped into water. Add pecans. Remove from heat, and stir for 3-5 minutes or until creamy. Drop by spoonfuls onto wax paper. Let cool for 30 minutes. Makes 12 large or 24 small pralines. These are delicious by themselves, or you can crumble 1 praline on top of 2 scoops vanilla ice cream for a wonderful dessert.